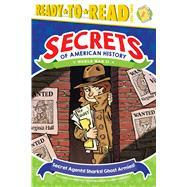 Discover the secret tactics Americans used to win World War II in this fact-tastic, nonfiction Level 3 Ready-to-Read, part of a new series about the secrets of American History! Before Julia Child was a famous chef, did you know she was cooking up shark repellant during World War II? It’s true…and that’s not the only exciting and interesting story from the war. Americans had to use clever and creative tactics to win their battles—tactics that included inflatable army tanks, costumes, and fake radio transmissions. Find out how and why it happened—and meet the woman who became the Allies’ most dangerous spy! An extend-the-learning section at the back of the book covers the ocean’s food chain, how area is calculated, and more!